A nutcracker is a device used to break open the shells of hard, dry fruits, known commonly as nuts, produced by certain species of trees. The edible material within the shell is known as the kernel. True nuts, including familiar foods such as pecans, hazelnuts, and walnuts, have shells which require nutcrackers. Other foods loosely called nuts include many which do not require a nutcracker, such as peanuts, almonds, and cashews, and those that do, such as the Brazil nut. Nutcrackers are also used to break open other hard foods, such as lobster. A wide variety of nutcrackers are used in modern kitchens, ranging from simple tools that resemble pliers to more complex devices that rely on carefully controlled pressure to crack open shells without damaging kernels. Their continued use in an era of readily available shelled nuts is explained by the proclivity of gourmet cooks for freshly shelled nuts. Also, many people collect decorative nutcrackers, which are designed more for appearance than for daily use. These collectible nutcrackers, often in the shape of humans or animals, are usually carved from wood, although some are made of cast iron or other materials. Human beings have eaten nuts since prehistoric times, and have always faced the problem of breaking open the shells. The earliest nutcracker was probably a rock used to smash open the nut, resulting in pieces of kernel mixed with pieces of shell. This method was improved when simple tools were developed. Early nutcrackers were probably made by connecting two pieces of wood or metal with a hinge. By placing the nut between the two pieces and squeezing them together, it would have been possible to exert control over the pressure applied. In this way, the shell could be cracked with less damage to the kernel. Although the exact details of the evolution of the nutcracker are lost to history, by the middle of the eighteenth century decorative wooden nutcrackers were carved by hand in many parts of Germany. These devices, also known as nut-biters, usually resembled a humorous human figure. The nut was placed in the figure's mouth. A set of handles were used to bring the figure's jaws together, cracking the nut. This type of nutcracker was so familiar in Germany in the early nineteenth century that the German writer E. T. A. Hoffman made one the hero of his fairy tale "Nussknacker und Mausekoönig" ("Nutcracker and Mouse King") in 1816. The Russian composer Peter Ilich Tchaikovsky adapted Hoffman's story into a ballet in 1891, and The Nutcracker has remained popular with audiences ever since, leading to an increased interest in collecting nutcrackers. The part of the world most famous for collectible nutcrackers is Erzebrige, a mountainous region of Germany near the border of the Czech Republic. A productive mining region since the fourteenth century, Erzebrige also developed woodcarving as an important industry. The founder of nutcracker carving in Erzebrige was Friedrich Wilhelm Fuuchtner. Around the year 1870 Fuuchtner began using a lathe to carve nutcrackers in the form of simple human figures, such as soldiers and police officers. These nutcrackers were carved from woods such as pine, beech, and alder, then painted in bright colors. The village of Seiffen where Fuüchtner made his nutcrackers remains famous for its wooden nutcrackers and toys. Although many decorative nutcrackers are still made by hand from wood, most modern nutcrackers in daily use are made from metal. Some nutcrackers of unusual design are made from various combinations of metal and wood or metal and hard plastic. The most common metals used to make nutcrackers are steel and cast iron. Steel is an alloy of iron and a small amount of carbon. Cast iron is an alloy of iron and a somewhat larger amount of iron. The raw materials used to manufacture both of these materials are iron ore and coke. Coke is formed when coal is heated to a high temperature in the absence of air, resulting in a substance which is rich in carbon. Chromium and nickel are often added to steel to form stainless steel. They may also be used to coat steel. Some steel nutcrackers, intended as impressive gifts, are coated with silver or gold. 1 Iron ore is dug out of surface mines. The ore is obtained in pieces of various sizes, ranging from particles as small as 0.04 in (1 mm) in diameter to lumps as large as 40 in (1 m) in diameter. Large lumps are reduced in size by being crushed. The smaller pieces then pass through sieves to sort them by size. Small particles are melted together into larger pieces, a process known as sintering. To make cast iron and steel, the pieces of ore should be from 0.3-1 in (7-25 mm) in diameter. 2 A conveyor belt moves a mixture of iron ore and coke to the top of a blast furnace. A blast furnace is a tall vertical steel shaft lined with heat-resistant brick and graphite. The mixture of iron ore and coke, known as charge, falls through the blast furnace. Meanwhile, air heated to a temperature of 1,650-2,460° F (900-1,350° C) is blown into the blast furnace. The hot air burns the coke, releasing carbon monoxide and heat. The carbon monoxide reacts with the iron oxides present in the ore to form iron and carbon dioxide. The result of this process is molten pig iron, which consists of at least 90% iron, 3-5% carbon, and various impurities. 3 To make cast iron, the molten pig iron is allowed to cool into a solid. It is then mixed with scrap metal. The scrap metal is selected to result in a final product with the desired characteristics. The mixture of pig iron and scrap metal is moved by a conveyor belt to the top of a cupola. A cupola is similar to a blast furnace, but is somewhat smaller. The pig iron and scrap metal fall on a bed of hot coke through which air is blown. This process removes the impurities and some of the carbon, resulting in molten cast iron, which is poured into molds to form ingots as it cools. 4 To make steel, the pig iron must have most of its carbon removed. The most common method used to make steel is known as the basic oxygen process. 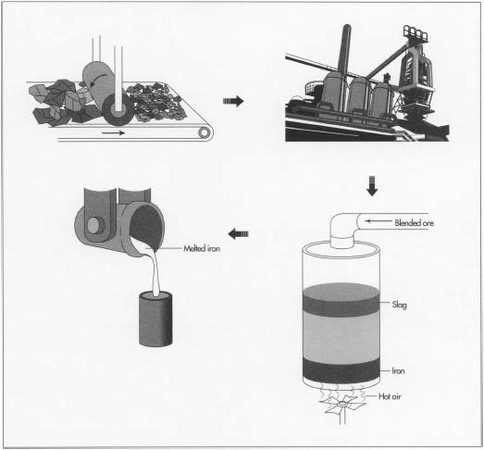 This procedure uses a steel container lined with heat-resistant brick. Scrap metal of the proper type to produce steel with the desired characteristics is loaded into the container. Molten pig iron, usually transported directly from the blast furnace without cooling, is added to the scrap metal. Pure oxygen is blown into the mixture at extremely high speeds. The oxygen reacts with various impurities in the mixture to form a mixture of solids, known as slag, floating on the molten metal. The oxygen also removes most of the carbon in the form of carbon monoxide gas. Lime (calcium oxide) is also added to the mixture. The lime acts as a flux; that is, it causes the substances in the mixture to melt together at a lower temperature than they would without it. The lime also removes sulfur in the form of calcium sulfide, which forms part of the slag. The slag is removed from the molten steel, which is poured into molds to form ingots, cooled between rollers to form sheets, or otherwise solidified. 5 Cast iron, as its name suggests, is usually shaped by casting. Casting involves pouring molten metal into a mold. The most common method used for cast iron is sandcasting. Most handheld nutcrackers are made of stainless steel. Steel is manufactured in a process that takes mined ore and refines it by melting the ore in a furnace. Once melted, the pure iron sinks to the bottom, while slag floats to the top. Chromium and nickel are added to create stainless steel. A pattern in the shape of the desired product is shaped from wood, clay, metal, or plastic. The pattern is firmly packed into sand which is held together with various substances known as bonding agents. The sand mixture is hardened by various methods, which may involve heat, pressure, or chemicals. The pattern is removed from the hardened sand. Molten cast iron is poured into the resulting mold and allowed to cool into a solid. 6 Steel can be shaped in a variety of ways. Molten steel can be poured into molds, much like cast iron. It can also be shaped by cold stamping. This process involves pounding a sharp die in the shape of the desired product into a thin sheet of steel. The die cuts through the steel, forming the product. Steel can also be shaped by drop forging. This process also requires a shaped die, known as a drop hammer. The drop hammer is pounded into a red-hot bar of steel. The pressure of the die strengthens the steel at the same time it shapes the product. Sand casting is the most common method used to cast iron. A pattern is shaped from wood, clay, metal, or plastic and then firmly packed into sand held together with various substances known as bonding agents. The sand mixture is hardened into a mold using heat, pressure, or chemicals. Molten cast iron is poured into the resulting mold and allowed to cool into a solid. into the nutcracker. Ball bearings strike the cast iron at high speed to remove any sand which clings to it. The cast iron is then polished with a surface grinder. A surface grinder is typically a rapidly spinning wheel covered with an abrasive substance. The abrasive grinds away a small portion of the surface of the cast iron, leaving it smooth. 8 Steel components are hardened by heating and cooling, a process known as tempering. 9 Depending on the exact structure of the nutcracker, assembly may be fairly simple or it may be quite complex. Precision drilling equipment it sued to form holes in the metal. The components are then brought together and rivets or screws pass through the holes and are tightened to hold the pieces of the nutcracker in place. Some nutcrackers may also require welding. 10 If the nutcracker is made form stainless steel, formed by adding chromium or nickel to the scrap metal and molten pig iron mixture, no protective coating is needed. Other metals are usually painted or covered with chromium or nickel. These metallic coatings are applied by giving a negative electrical charge to the nutcracker in a solution containing positively charged particles of chromium or nickel. The particles are attracted to the nutcracker, coating it evenly and smoothly. The coated nutcracker is removed from the solution, cleaned, and is ready to be packaged and shipped. After cast iron and steel parts are formed they are inspected to ensure that all the shapes are correct. Sharp edges or small irregularities produced during the shaping process are removed by hand using tools such as files. During the assembly process, the tools used to drill holes may cause irregularities in the metal. Again, these can be removed using hand tools. After being painted or plated, the nutcracker is inspected to ensure that the protective coating covers the entire surface. Any flaws found are corrected by repeating the procedure. A sample nutcracker may be tested after it is manufactured to ensure that it operates correctly. In general, nutcrackers are extremely reliable tools, so frequent testing is not necessary. Although the nutcracker seems to be a simple device with little room for improvement, inventors are always working on better ways to break open shells without damaging kernels. Various designs have been proposed which are much different from the traditional plier-shaped nutcracker. One simple but innovative device consists of a metal screw which rotates into a small plastic bowl. The nut in placed in the bowl and the screw is twisted until it cracks the shell. A more complex device which uses a similar mechanism consists of a small metal handle attached to a large handle which contains an opening. The nut is placed in the opening. Pulling the small handle toward the large handle causes a knob to be cranked up a notch toward the nut. Repeating the action increases the pressure until the nut cracks. Both these devices allow the amount of pressure placed on the nut to be carefully controlled; too little pressure fails to crack the shell, but too much pressure shatters the kernel. A more radical design is found in the Texas Native Inertia Nutcracker. This unusual device, made from oak, steel, and aluminum, uses a rubber band to power a battering ram which cracks the nut. Imitations of this innovative device are usually made from hard plastic and might be shaped like a gun whose trigger pulls the rubber band. The future will continue to see changes in nutcracker design, while collectible wooden nutcrackers carved in the style of nineteenth century artisans will continue to be popular. Beard, James, et al., ed. The Cooks' Catalogue. Harper and Row, 1975. Campbell, Susan. Cooks' Tools. Morrow, 1980. LaTorre, Bob. "Nutcrackers." Mother Earth News (November/December 1986): 54-56. Smith, Louvinia T. "Nutcrackers." Antiques and Collecting (December 1996): 38-39. "A Little History." August 11, 1997. http://members.aol.com/trcdesign/history.htm/ (June 29, 1999). "The Story of the Nutcracker." December 28, 1992. http://www.serve.com/shea/germusa/nutcrack.html (June 29, 1999).